Karen is a Senior Vice President at CFSI and head of CFSI’s long-term savings and retirement practice. 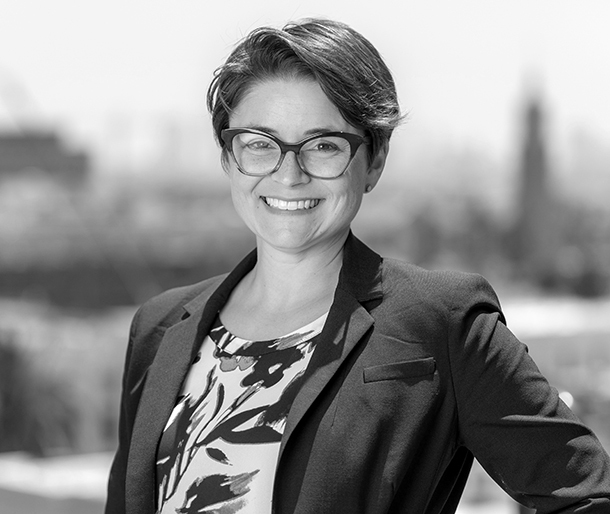 She leads CFSI’s growing work and strategy in the retirement space, including multiple research and thought leadership projects focused on accelerating private market innovation that can bolster the long-term financial health of vulnerable workers, pre-retirees, and retirees alike. Karen is currently a Senior Fellow at the Aspen Institute Financial Security Program, where she leads the Aspen Leadership Forum on Retirement Savings. A ten-year veteran of CFSI, Karen led the development of our Financial Health Network, a community of over 150 financial services innovators committed to building products, services, and engagement models that generate improved financial health outcomes for consumers. She serves as a senior consultant in CFSI’s consulting practice and specializes in advising the largest financial services brands in the country – including mega- and regional banks, payments networks, asset managers, and insurance companies — on their financial health strategies. Karen speaks regularly at industry conferences on how financial services providers can leverage innovation to deliver financial health strategies that create value for the customer and business alike. Karen began her career in the retirement industry as a bilingual 401(k) plan educator for both Strong Funds and Wells Fargo Institutional Trust Services. Her years in factories, hotels, and on hog farms, speaking directly with thousands of diverse workers, convinced her that financial services can and should be a force for good in the lives of all Americans, and that the 401(k) record keeping and asset management industries in particular have a critical role to play in improving Americans’ financial health. Karen holds M.B.A. and M.P.P. degrees from the University of Michigan. She also holds a B.A. in Spanish and Art History, with a minor in Mathematics, from Indiana University. She lives in Ann Arbor, Michigan, with her husband, Matt, and two young sons. In the first of this quarterly series, CFSI's VP of Policy and Innovation shares CFSI's new policy strategy, three key focus areas for 2019 and what topics he sees on the policy horizon in the future. Using data from the U.S. Financial Health Pulse, CFSI identifies five challenges for the LMI 50+ and opportunities for providers to support this fast-growing segment. In this report, CFSI looks at long-term savings and beyond to understand how day-to-day financial challenges of LMI pre-retirees and retirees are getting in the way of their long-term financial health.